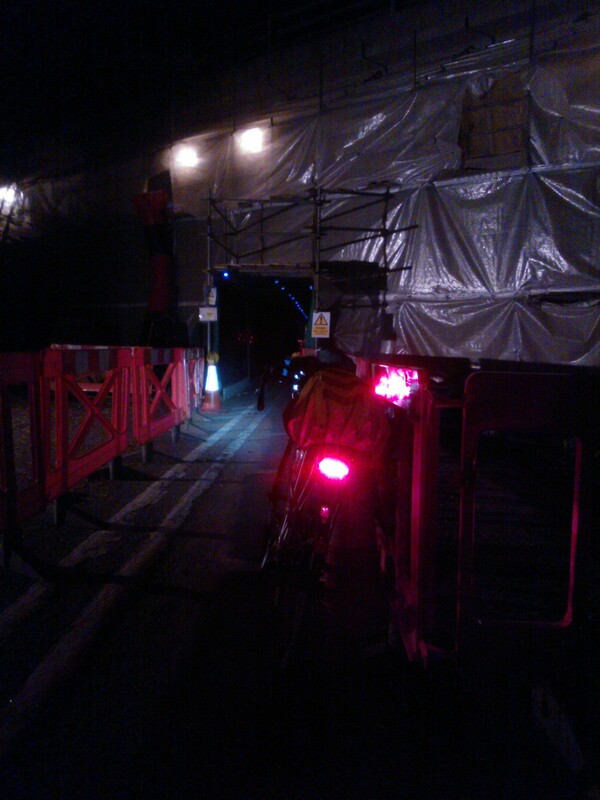 My first failed Audax for a while. To be fair, I decided to start hard on my quest for Super Randonneur with a 600k through Wales. In the end, I made it back to Bristol, completing 500k and thus my longest ride to date: https://connect.garmin.com/activity/764432153. Again, Dave was up for the foolhardiness, so joined me on the adventure. The original plan was to leave Dave’s house at 3pm on Friday (after a nice long lie-in), cycle straight through the Night into and through Saturday, hopefully arriving at my parents house in Bristol for a quick sleep after 24 hours or so, then press on into the early hours of Sunday back home to make it easily within the 40 hours time limit for a 600k (15kph average). In the end, we arrived in Bristol after 31 hours (about 22:30), which was pretty much bang on 15kph. I couldn’t go through another night with no sleep, so decided to abandon, especially as my knees were in abit of trouble. Dave pressed on, but had to sleep in a field and bus shelters eventually arriving back home at mid-day on the Sunday. Despite not making our time limit, there were some great moments. (don’t know about great, but memorable) The police car that tried to wreck us, pirate style. It was parked in a layby facing us, but it was the wrong side of the road. We both assumed it had pulled over to the left, not the right and were really confused when we tried to go to the left of it, that we suddenly ended up on stones and grass! The descent of the mountain pass to Newton was freezing, but extremely exciting, followed by the (again excellent) Weatherspoons enormous cooked breakfast. Ice cream in Hay on Wye. 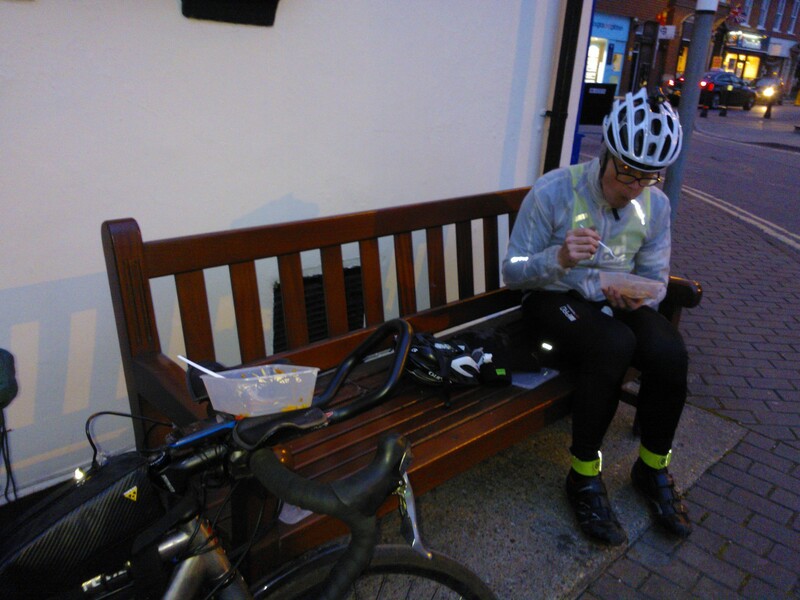 The main low points were: realising at Newton that we were in big trouble with time; getting very cold (to the point of ringing my wife to find train stations) on the descent to Rhayader) and the 24hr petrol station at Leominster, where the man in the window asked me “would I like sugar with my tea”. I said “yes”. He handed me a black tea and a packet of sugar. I enquired about milk. The chap looked really surprised, had a little wander round the shop and then said there wasn’t any. So, black tea, when I REALLY needed a good cuppa at 4am! 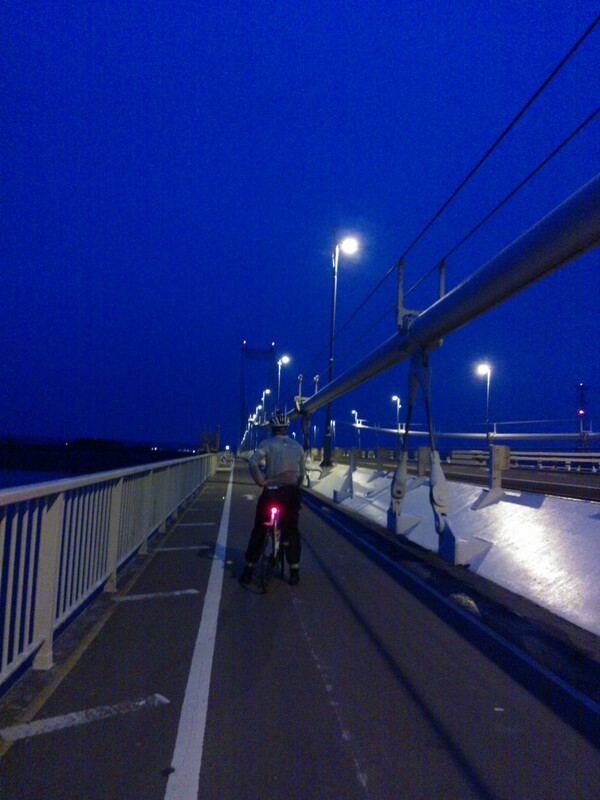 The planned route was 630km, rather than 600. Dave suffered a mechanical (all the bearings fell out of the jockey wheel in the rear mech, something I’ve never seen before) near Mortimer. We fortunately managed to find a bike shop that was open late, so could get a replacement, but this added 8km to our route. I also made a mistake in navigation after Leominster (maybe tea deprived), which took us to Knighton via Ludlow, rather than direct. This added another 12km. So in the end the full route (as Dave discovered) was 650km. If this had all been factored in to the Audax time limit, it would have given us another 3 hours on our time limit. We didn’t build a buffer during the relatively flat section to Wales with a tailwind. Our average was 18.5kph (factoring in the extra 20km of mechanical and navigation error). This should have been well above 20kph. The moving average over this section was 23kph, so we probably stopped too much. Whether we could have made the rest without stopping that much is a moot point. Our speed through the night (and much of Saturday) wasn’t helped by it being cold and wet. We would stop at a petrol station, get cold, put on layers, get even colder with a descent, then boil going up the next hill, stop to take layers off, then get freezing again on the next descent, with added wetness from our sweat. Cold seem to be a problem on these long rides, as we’re not generating the heat with high speed riding. It seems that in temperatures where I’d be warm in a long sleeve top during my commute, I get chilled with two base layers, a cycling shirt, thermal tights and a rain jacket. Maybe the winter jacket next time, though this could easily be soaked by sweat. My plan was too optimistic with timings. If we had left at 10am, rather than 3pm on the Friday, we could still have gotten a lie-in, probably not suffered that much more with sleep deprivation on the Saturday, but had 5 more hours before collapse on the Saturday. The plan was based around having light for the descent to Newton, but dawn was surprisingly early and a long time before sunrise. 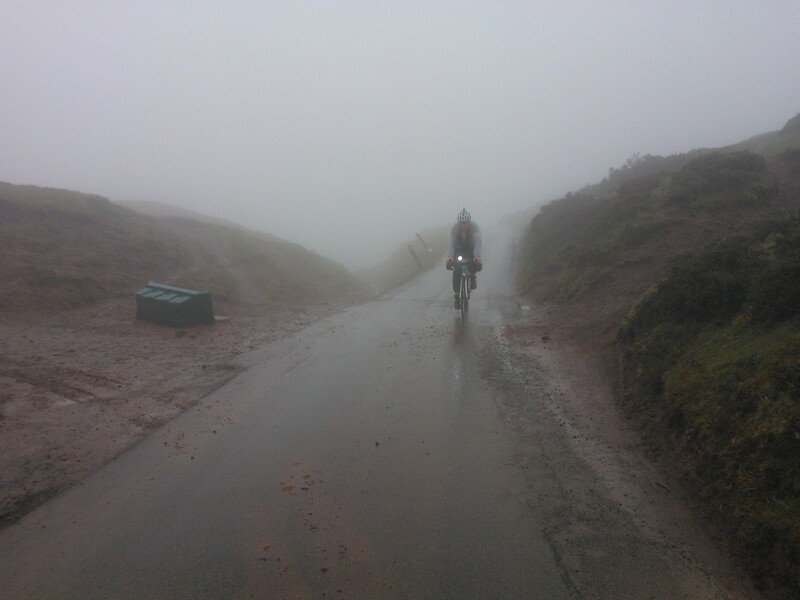 Maybe Welsh mountains were overly ambitious for our first attempt at a 600. I have an Ely, Lincoln & the Fens route up my sleeve as a plan B. The Brooks Swift held up well. I can’t say it was blissful, but nothing would be for 30+ hours. But compared to previous long rides (except my last 300, also with the Brooks), it was marvellous. My left shoulder started to really ache after about 350km, which was hard to deal with because any position on the bike put pressure on it, apart from sitting bolt upright holding the TT arm rests. Not ideal. This trouble stabilized, but it wasn’t ideal. All in all, hard work, but a real adventure that I’ll remember for a while, or at least my knees will! One week later and I’ve cycled to work once, my knees are actually fine, they had stopped hurting by the Tuesday, but my left Achilles tendon is pretty sore still. This twinged a little during the ride, but not to the extent of the knees, so it’s strange that it should be the long term problem.